Indian conglomerate Aditya Birla Group launched ABOF on 16th of October’15 and entered a space that is dominated by category specialists Jabong and Myntra. When you consider the fact that Aditya Birla is the largest fashion player in India through Madura Fashion and Pantaloons, which were acquired by it in 1999 and 2012 respectively, its foray in fashion e-commerce seems natural. 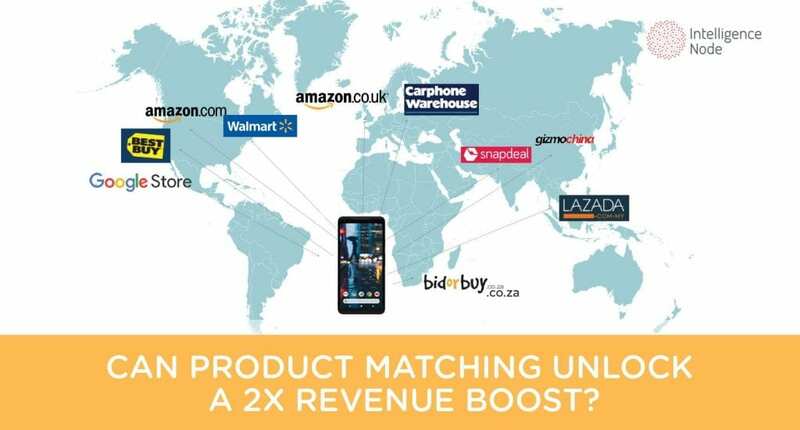 Plus, it’s hard not to be tempted by the traction ecommerce has been getting with a string of multi-million dollar mergers & acquisitions and VC funding activities over the past few years. According to various estimates for the year 2020 from sources like Goldman Sachs & PwC, the Indian ecommerce market is slated to be worth $60 to $100 billion. ABOF has made it abundantly clear that it’s going after millenials. “Today’s millennial generation wants everything fast and personalized. Within fashion, we identified this as a white space that can be tapped into by a focused player,” says Prashant Gupta, President and CEO of ABOF. No surprises here, ABOF did what’s expected of a new entrant, it sharply increased its merchandise from 3885 SKUs to 10,888 SKUs between 20/10/2015 and 30/11/2015. Meanwhile, Myntra and Jabong experienced a progressive decrease. Our analysis shows that ABOF has entered the online fashion marketplace with a lot of aggression. Towards the end of our study period, ABOF was well above the 275% mark for relative change in the number of products listed on the newly minted site. It’s bit of a surprise to discover that Jabong had the highest number of products in the upper and middle price range, which pushed its average price significantly higher than the other two. Jabong’s steady trend line indicates that this is a well thought out pricing strategy. We randomly compared a few items sold on the same day on all three marketplaces and found ABOF competing very closely with Myntra on price. A considerable price difference was found on Jabong’s website. It didn’t matter if Jabong was cheaper or dearer than the other two, the price gap was stark. This reaffirms the fact that Jabong has a higher proportion of expensive products than cheaper ones compared to ABOF and Myntra. The following snapshots give a better perspective. This chart’s remarkable resemblance to a sharp-shooter’s crosshairs tells us that ABOF is onto something disruptive. Observe how the average price trendline suddenly drops from Rs 1830 to Rs 1560 and crosses path with the rising quantum of products. This implies that the online retailer added more products from the lower price brackets and brought its average price down. 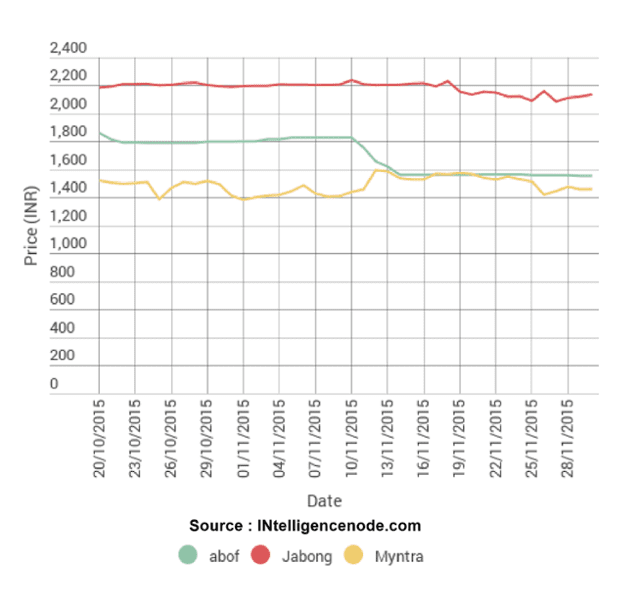 Consistent with their positioning and strategy, the average price on Abof was 4.8% higher than those on Jabong and Myntra in the lowest two (0-1000 and 1000-2000) price ranges. That being said, ABOF’s products in the higher price brackets are positioned lower and hence highly competitive. 85% of the combined catalogue of all the three retailers is within the 0-1000 and 1000-2000 price ranges. Breaking it down further, 53% of their combined catalogue is priced in the Rs 0 to 1000 price range. They are clearly enticing the young demographic whose access to disposable cash is limited. Topwear is the battleground for all. The fact that ABOF increased its topwear range between the two dates is clear indication that it’s in it to win it. Jabong added the highest number of topwear products during the study period, with shirts and t-shirts being the most favored sub-categories. Jabong added the maximum (approx. 9160) number of products to its site, 54% of which were added to topwear alone. ABOF on the other hand added close to 6400 products to its site of which 57% were topwear. Myntra, Jabong and ABOF cover 1794 brands collectively. In line with its strategy to offer a curated experience, ABOF covers only 53 brands of which 1 is its own. The 52 brands that ABOF has listed on its site are sold by the other two retailers too. It’s obvious that ABOF does not want to overwhelm its audience and wants to offer a leaner marketplace compared to Myntra and Jabong. ABOF seems to be a highly focused retailer, who wants to address what it perceives to be a problem of plenty. This explains why it has featured a mere 53 brands compared to more than a thousand brands listed by both Jabong and Myntra. ABOF’s focus on the topwear category is consistent with the other players and suggests that it understands the game well. By keeping its ticket price lower than Jabong and Myntra for the Rs 2000 plus ranges, ABOF is intent on hiting the competition where it hurts the most.